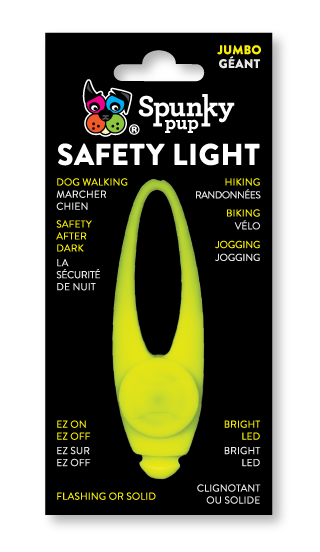 The Flash & Glow Safety Light is perfect to keep you and your dog safe on night time walks. 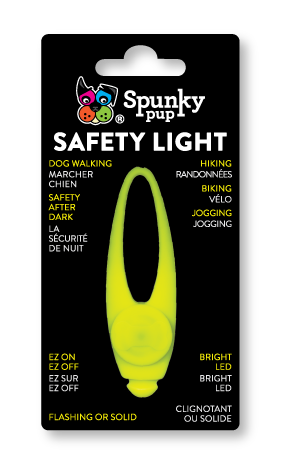 Attach this bright, colorful LED to you or your dog to be seen from a distance. Just wrap the durable, silicone light around your dog’s collar or leash or your shoe laces, belt loop, backpack/bag/purse, almost anything you can stretch the light around. Use as a safety light for kids too or get creative and wear as a fun, flashing accessory! Easy push-button with 3 modes: Blinking, Flashing and Solid. Fun neon colors. For use with dogs of any size. Not for use as an animal toy. 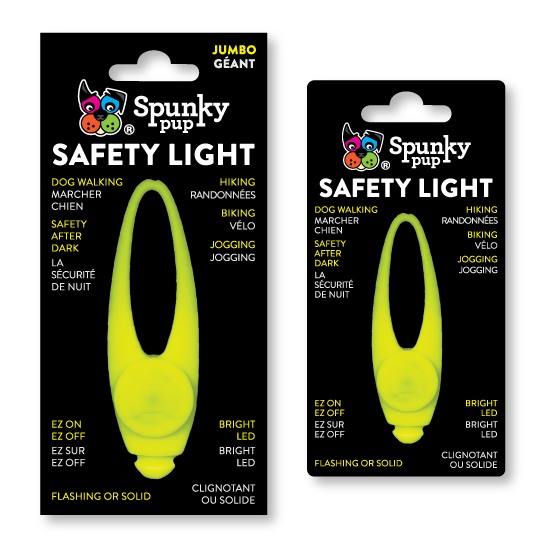 The Jumbo size flash & glow safety light by Spunky Pup is great for dogs with larger collars. – 100% Silicone, High-Visibility LED Lights, Easy to Attach to Collars, Leashes, Backpacks or Clothing, etc. – To activate light, open and remove small paper tab located under LED module. 3″ x 1″ x 1″ – weight 2 oz.